A stunning new two bedroom duplex penthouse apartment, situated overlooking the beautiful Santa Maria Golf Course, with 80m2 balcony area wrapped around the outside of the property, providing breathtaking panoramic views of the sea, mountains, green hills, and of course the golf course itself. With arguably the best views on the entire complex, the location allows you to capture the sunrise, and beautiful sunsets over the mountain range. The apartment also overlooks the main swimming pool on the complex, and is adjacent to another of the four pools. The apartment has been furnished to a high standard, and provides a modern Miami-Chic feel, with all mod cons, including A/C, Wi-Fi, Sky TV, and 42” curved plasma TV. Both bedrooms feature en-suite travertine marble bathrooms, and built in wardrobes. All rooms lead out on to the terrace area, and the master bedroom upstairs also hosts its own extra private terrace. The apartment benefits from a beautiful outdoor table, which is perfect for al-fresco dining, with a lowered glass terrace wall to maximise the incredible views whilst you dine. During clear days/ evenings you can see across to Gibraltar and even as far as the Mountains on the northern coast of Africa. There is secure underground parking available, which provides direct access to the apartment via elevator. The apartment is a five minute walk to Santa Maria Golf and Country Club, and a 15 minute walk along palm tree lined roads, to the village square, featuring a number of restaurants, cafes, bars, and supermarkets. The complex is also within easy reach of a number of stunning beaches, a 15 minute drive to La Cañada Shopping Mall, and only 20 minutes from the famous Puerto Banús… the European millionaires playground. The location offers access to countless golf courses, numerous beach clubs and restaurants, water sports centres, the Amazonia Adventure centre for kids. It is the ideal location for a long-stay winter holiday under a highly appreciated micro climate with temperatures around 20º C.
Rental price includes Wi-Fi, Full English Sky TV package, cleaning, bath & hand towels, and taxes. *A meet and greet service is available at an additional cost. I purchased this apartment last year after falling in love with the area and the apartment its self. I have had the pleasure of enjoying this luxury apartment over the last 12 months and I am now opening it up for others to enjoy also. The property is located in the beautiful and highly sought after area of Elviria, East Marbella. The apartment has fantastic indoor and outdoor living space and the views from the apartment are just breathtaking. Elviria has a vast amount to offer, whether you are a family with children, a couple wanting a relaxing holiday or an avid golfer! Elviria is a beautiful urbanisation situated between Marbella and Fuengirola on the Costa Del Sol. It is a popular holiday resort and is home to the 5* Don Carlos Hotel and famous Nikki Beach Club. The beautiful old town of Marbella is a short 10 minute drive away and offers dining in the charming Plaza de los Naranjos (Orange Square). 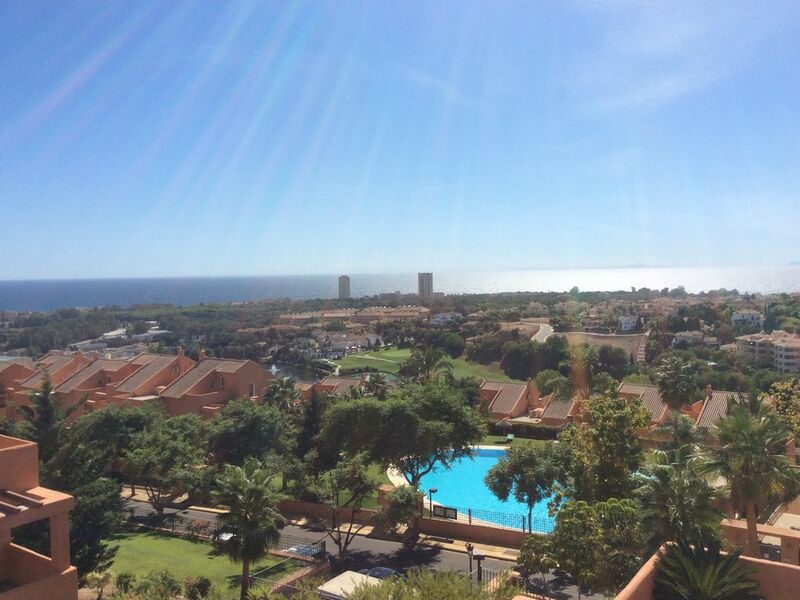 The apartment overlooks the internationally renowned Santa Maria Golf and Country Club. The large shopping centre of La Cañada is situated only a short drive away and boasts over 200 stores. To the east of Elviria is the old coastal town of Fuengirola which hosts some excellent Tapas bars and delightful traditional Spanish restaurants. The apartment is a pleasant walk away from a number of different restaurants and bars including Spanish, Italian, Chinese, Indian and British options. Views from this property are amazing. Apartment is great, modern, spacious, private and clean. Everything you need is in it. Property was easy to find with the directions given. Our weeks stay there was great and very relaxing. Would definitely recommend to others. Well placed property within 10 minutes of restaurants, supermarkets and bars. Emma's property is in a stunning location with great views of the mountains and coast. If you rent a car the property is only a 10 minutes drive to the local restaurants, supermarkets and bars. The fantastic Cabapino beach is less than 15 minutes drive away and the main A-7 motorway allows easy access to Estepona, Fuengirola and Puerto Banus. Malaga airport is a comfortable 60 minutes drive away and less if you take the AP-7 toll road. The property is set on a lovely quite complex surrounded by lovely trees, flowers and well kept gardens. Underground parking is provided with access to the property via a lift. Emma's apartment is set over two floors with one of the bedrooms being upstairs, each floor has a fantastic balcony with garden furniture provided. The apartment is clean and provides all we required to make our holiday a perfect one. A special mention to the entertainment system provided, large screen curved TV with Sky channels and a strong internet connection along with location made this apartment the perfect choice for us. We have stayed in many apartments along the Costa Del Sol coast and Emma's apartment is one of the best we have stayed in. We would not hesitate to book this apartment again. We have just returned from a two week stay at this property. Emma the owner was very helpful and punctual answering our questions during the booking and lead up to our holiday. The property itself is beautiful, extremely clean and well furnished. The views are stunning from the balconies and the outdoor furniture so comfortable for relaxing and taking in these views. The beds were all very comfortable and the air conditioning ensured a good nights sleep during peak season. Having our bedroom and ensuite on the upper level gave my husband and I privacy and peace from teenagers. A few storage containers and a few serving bowls in the kitchen would have been useful but otherwise it was well equipped. The property is very secure and gated with private underground parking. We hired a car but it is not essential, the walk to nearest shops and bars takes about twenty minutes but is uphill on the way back so a taxi home is about five euros. The complex has four swimming pools and we were always able to find a quiet one with available sun loungers any time of day even at this busy time of year. Our teenage son and nephew were more than happy with free wifi and sky TV when they had had enough of the pool. It would have been helpful to have had two sets of keys; as a group of four we often were off doing our own thing and was difficult to synchronise pool, property and complex access but otherwise cannot fault the accommodation. We had a lovely stay and hopefully will return next year. Our first experience with this property was a little stressful as the owner had given us the wrong directions. Leaving aside the initial fright, the apartment is spotlessly clean and well equipped with modern appliances. Unless you are fond of walking and exercise a car is desirable as it is about a thirty minute walk to shops etc. with a very steep return journey. The underground car parking is extremely tight and even challenged my husband who is an advanced driver. The magnificent views are marred only by a large sewage treatment plant which does NOT cause any nuisance. My daughter amusingly thought that the flames caused by burning excess gases were from an exotic nightclub ! When the management company representative arrived on Monday we were warned about causing damage to the snow white cloth on the outdoor furniture. At 4pm on Saturday 16th the power failed as we were cooking dinner. We reset the fuse but the power would not return. The management company responded and after some investigations it was disclosed that the main fuse had blown and that power could not be restored until Monday as a fuse had to be purchased in Marbella. The management company said that they were authorised to offer us €100 for alternative accommodation. We politely declined the offer until we could better calculate exactly what this experience would cost us. We lost a fridge full of food and had to purchase all meals out for the four of us from Saturday evening until late Monday morning when the fault was fixed. In addition we spent two very uncomfortable nights without air conditioning. On returning home we contacted Emma the owner and suggested that €200 as a gesture towards our expense would not be unreasonable. We were shocked by her reply. She advised us that we had caused the power outage by using too many electrical appliances at once and that she still had not received the electricians bill. She also accused us of having caused damage to the outdoor furniture by leaving it exposed to bird droppings. When asked for evidence of this none was forthcoming. We were wrongly accused of damaging the floor which is a natural marble floor with veining which in places causes razor shards to come loose. We are careful and responsible people. I am a teacher and my husband is a senior Police Officer of 36 years standing. We are veterans of the Costa and Homeaway and have never had a bad experience. We will not be returning here. A beautiful apartment but CAVEAT EMPTOR. The overall experience was very positive and one we would like to revisit. The apartment is in an excellent location over looking the Santa Maria golf course and situated on the second floor affords an excellent sea facing view from the copious balcony space which is very well furnished. There was two pools very close to the apartment and the main pool is very large and there is plenty of space to take in the weather. Beaches are only a 10 minute drive if you want to have the beach experience. Dealing with the owner was very easy and she was found to be very helpful. We would recommend this property and would like to return again. A car is recommended though Eliviria is walkable and there is plenty of taxi's available. There are plenty of good restaurants nearby and there is no pressure to travel very far. There is an underground garage and an allocated car space, which is a little tight.